It's 2012, and the apocalypse is on everyone's mind. But Daniel Richter's apocalyptic visions, like old-Western cinemascapes mixed with psychedelic 60's rock, make worldwide destruction look achingly cool. Richter's new solo exhibition is called 'A concert of purpose and action,' based on Woodrow Wilson's 1917 declaration of war on Germany. The exhibition features a foreground of lonely, ordered heroism against a background of ecstatic chaos. The paintings are Cormac McCarthy meets Woodstock. References are jumbled up and hyperbolized as historical context, politics, art history, rock-n-roll and abstraction are all intertwined. The limits of heroism remain a constant theme throughout. Country western maidens wait peacefully on an electrified cliff in one image while masked ninjas sprint through graffiti lightning bolts in another. Some are peaceful, others anarchic, but in all of them, the protagonist in all his glory still pales in comparison to the gargantuan complexity of his surroundings. Richter's nightmarish canvasses capture the toxic exoticism of our looming apocalypse, where human heroism cannot save us. The neon colors, hooded figures, and geologically vibrant landscapes make us kind of excited for it. 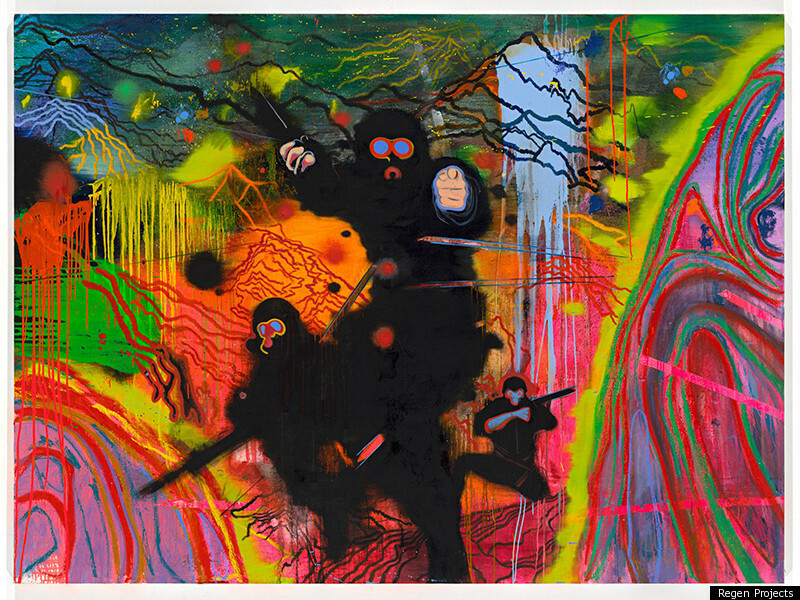 Daniel Richter will show at Regen Projects until February 18, 2012.